Electron micrograph (X30,000) of Nosema connori in diaphragm showing a coiled polar filament (arrow). Courtesy of the Armed Forces Institute of Pathology (AFIP 71-11521-4). Humans acquire microsporidiosis through ingestion or inhalation of microsporidia spores. Studies have isolated Encephalitozoon species in the urinary tract in those with disseminated infections, suggesting that sexual transmission is possible. The spore is the infective form. Spores are environmentally resistant and are surrounded by an outer electron-dense glycoprotein layer and an electron-lucent endospore layer composed primarily of chitin. The spore extrudes its polar tubule and injects the infective sporoplasm into the host cell. Once inside the cell, it multiplies by binary fission or schizogony. Development can occur directly inside the host cell cytoplasm or inside parasitophorous vacuoles. As mature spores develop and accumulate, the cell expands and eventually ruptures, releasing the spores. Currently, most cases of microsporidiosis are reported in immunosuppressed adults, especially those with HIV-related immunosuppression. Studies have found that E bieneusi infection of small intestinal enterocytes is detected in 15-34% of patients with AIDS with chronic diarrhea and no other identified causes. Microsporidia have a worldwide distribution. Cases of microsporidiosis have been reported in both developed and developing countries and among both immunosuppressed and immunocompetent individuals. Microsporidiosis has been reported in the Americas, Asia, Europe, and Africa. Bilateral punctate epithelial involvement of the cornea is the typical manifestation of ocular microsporidiosis in immunocompromised individuals. Most cases of intestinal and disseminated microsporidiosis in patients infected with HIV are reported in those who are severely immunocompromised (CD4 < 100/µL); in these patients, morbidity can be significant. E bieneusi infections often result in protracted debilitating illness with diarrhea, which may last several months. E bieneusi infections carry a mortality of up to 56%. In addition to chronic diarrhea, malabsorption and wasting can occur in persons with AIDS. E bieneusi is responsible for more than 90% of intestinal microsporidiosis cases in this population; E intestinalis accounts for the remainder. Reports of E bieneusi infections are increasing among travelers and residents of tropical countries who do not have HIV infection. E intestinalis infection associated with chronic diarrhea has been reported in immunocompetent travelers. E bieneusi is usually found only in enterocytes. E intestinalis is more invasive and produces disseminated disease involving the small and large intestines, gallbladder, urinary tract epithelium, and respiratory tract epithelium. Biliary tract involvement that progresses to cholangitis and cholecystitis is common in patients with AIDS who have E bieneusi infection. Myositis due to Pleistophora infection has been documented. Microsporidiosis has no known racial predilection. Microsporidiosis has no known gender predilection. Microsporidiosis has no known age predilection. Most patients who develop intestinal microsporidiosis are severely immunosuppressed; therefore, the prognosis is usually poor in these patients. Diarrhea generally resolves spontaneously in immunocompetent patients who develop microsporidiosis. Counsel patients regarding meticulous handwashing to help decrease the risk of opportunistic infections. Loignon M, Labrecque LG, Bard C, Robitaille Y, Toma E. Cerebral microsporidiosis manifesting as progressive multifocal leukoencephalopathy in an HIV-infected individual - a case report. AIDS Res Ther. 2014. 11:20. [Medline]. [Full Text]. Ladapo TA, Nourse P, Pillay K, Frean J, Birkhead M, Poonsamy B, et al. Microsporidiosis in pediatric renal transplant patients in Cape Town, South Africa: Two case reports. Pediatr Transplant. 2014 Nov. 18(7):E220-6. [Medline]. Hocevar SN, Paddock CD, Spak CW, Rosenblatt R, Diaz-Luna H, Castillo I, et al. Microsporidiosis acquired through solid organ transplantation: a public health investigation. Ann Intern Med. 2014 Feb 18. 160(4):213-20. [Medline]. Bukreyeva I, Angoulvant A, Bendib I, Gagnard JC, Bourhis JH, Dargère S, et al. Enterocytozoon bieneusi Microsporidiosis in Stem Cell Transplant Recipients Treated with Fumagillin. Emerg Infect Dis. 2017 Jun. 23 (6):1039-1041. [Medline]. Coyle CM, Weiss LM, Rhodes LV, et al. Fatal myositis due to the microsporidian Brachiola algerae, a mosquito pathogen. N Engl J Med. 2004 Jul 1. 351(1):42-7. [Medline]. Aikawa NE, Twardowsky Ade O, Carvalho JF, Silva CA, Silva IL, Ribeiro AC, et al. Intestinal microsporidiosis: a hidden risk in rheumatic disease patients undergoing anti-tumor necrosis factor therapy combined with disease-modifying anti-rheumatic drugs?. Clinics (Sao Paulo). 2011. 66(7):1171-5. [Medline]. [Full Text]. Didier ES, Weiss LM. Microsporidiosis: not just in AIDS patients. Curr Opin Infect Dis. 2011 Oct. 24(5):490-5. [Medline]. Chan CM, Theng JT, Li L, et al. Microsporidial keratoconjunctivitis in healthy individuals: a case series. Ophthalmology. 2003 Jul. 110(7):1420-5. [Medline]. Font RL, Su GW, Matoba AY. Microsporidial stromal keratitis. Arch Ophthalmol. 2003 Jul. 121(7):1045-7. [Medline]. Anane S, Attouchi H. Microsporidiosis: epidemiology, clinical data and therapy. Gastroenterol Clin Biol. 2010 Sep. 34(8-9):450-64. [Medline]. Bach AC, Babayan VK. Medium-chain triglycerides: an update. Am J Clin Nutr. 1982 Nov. 36(5):950-62. [Medline]. Wanke CA, Pleskow D, Degirolami PC, et al. A medium chain triglyceride-based diet in patients with HIV and chronic diarrhea reduces diarrhea and malabsorption: a prospective, controlled trial. Nutrition. 1996 Nov-Dec. 12(11-12):766-71. [Medline]. Ott M, Fischer H, Polat H, et al. Bioelectrical impedance analysis as a predictor of survival in patients with human immunodeficiency virus infection. J Acquir Immune Defic Syndr Hum Retrovirol. 1995 May 1. 9(1):20-5. [Medline]. Sharpstone D, Rowbottom A, Francis N, et al. Thalidomide: a novel therapy for microsporidiosis. Gastroenterology. 1997 Jun. 112(6):1823-9. [Medline]. Bartlett JG, Belitsos PC, Sears CL. AIDS enteropathy. Clin Infect Dis. 1992 Oct. 15(4):726-35. [Medline]. Carr A, Marriott D, Field A, et al. Treatment of HIV-1-associated microsporidiosis and cryptosporidiosis with combination antiretroviral therapy. Lancet. 1998 Jan 24. 351(9098):256-61. [Medline]. Conteas CN, Berlin OG, Ash LR, et al. Therapy for human gastrointestinal microsporidiosis. Am J Trop Med Hyg. 2000 Sep-Oct. 63(3-4):121-7. [Medline]. Cunningham E. Ocular Complications of HIV Infection. The Medical Management of AIDS. Philadelphia, Pa: WB Saunders, Co; 1999. 171-84. DeGirolami PC, Ezratty CR, Desai G, et al. Diagnosis of intestinal microsporidiosis by examination of stool and duodenal aspirate with Weber's modified trichrome and Uvitex 2B strains. J Clin Microbiol. 1995 Apr. 33(4):805-10. [Medline]. Didier ES. Microsporidiosis. Clin Infect Dis. 1998 Jul. 27(1):1-7; quiz 8. [Medline]. Didier ES. Microsporidiosis: an emerging and opportunistic infection in humans and animals. Acta Trop. 2005 Apr. 94(1):61-76. [Medline]. Diesenhouse MC, Wilson LA, Corrent GF, et al. Treatment of microsporidial keratoconjunctivitis with topical fumagillin. Am J Ophthalmol. 1993 Mar 15. 115(3):293-8. [Medline]. Dore GJ, Marriott DJ, Hing MC, et al. Disseminated microsporidiosis due to Septata intestinalis in nine patients infected with the human immunodeficiency virus: response to therapy with albendazole. Clin Infect Dis. 1995 Jul. 21(1):70-6. [Medline]. Dunand VA, Hammer SM, Rossi R, et al. Parasitic sinusitis and otitis in patients infected with human immunodeficiency virus: report of five cases and review. Clin Infect Dis. 1997 Aug. 25(2):267-72. [Medline]. Dunn JP, Holland GN. Human immunodeficiency virus and opportunistic ocular infections. Infect Dis Clin North Am. 1992 Dec. 6(4):909-23. [Medline]. Eeftinck Schattenkerk JK, van Gool T, et al. Clinical significance of small-intestinal microsporidiosis in HIV-1-infected individuals. Lancet. 1991 Apr 13. 337(8746):895-8. [Medline]. 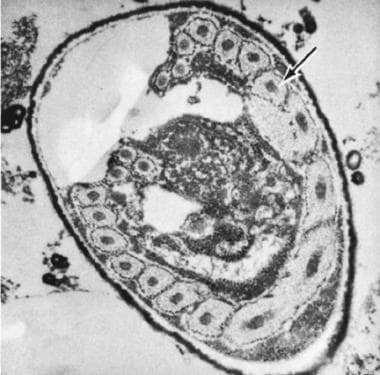 Garcia L, Bruckner D. Intestinal Protozoa (Coccidia, Microsporidia) and Algae. Diagnostic Medical Parasitology. 3rd ed. Washington, DC: ASM Press; 1997. 54-89. Gunnarsson G, Hurlbut D, DeGirolami PC, et al. Multiorgan microsporidiosis: report of five cases and review. Clin Infect Dis. 1995 Jul. 21(1):37-44. [Medline]. Infectious Diseases Society of America. 1999 USPHS/IDSA guidelines for the prevention of opportunistic infections in persons infected with Human Immunodeficiency Virus. USPHS/IDSA Prevention of Opportunistic Infections Working Group. Infectious Diseases Society of American. Ann Intern Med. 1999 Dec 7. 131(11):873-908. [Medline]. Kartalija M, Sande MA. Diarrhea and AIDS in the era of highly active antiretroviral therapy. Clin Infect Dis. 1999 Apr. 28(4):701-5; quiz 706-7. [Medline]. Kester KE, Turiansky GW, McEvoy PL. Nodular cutaneous microsporidiosis in a patient with AIDS and successful treatment with long-term oral clindamycin therapy. Ann Intern Med. 1998 Jun 1. 128(11):911-4. [Medline]. Kotler DP. Malnutrition in HIV infection and AIDS. AIDS. 1989. 3 Suppl 1:S175-80. [Medline]. Kotler DP. Nutrition and Wasting in HIV Infection. MEDSCAPE HIV Clinical Management Series. 1999. 8:1-33. [Full Text]. Lew EA, Poles MA, Dieterich DT. Diarrheal diseases associated with HIV infection. Gastroenterol Clin North Am. 1997 Jun. 26(2):259-90. [Medline]. Lowder CY, McMahon JT, Meisler DM, et al. Microsporidial keratoconjunctivitis caused by Septata intestinalis in a patient with acquired immunodeficiency syndrome. Am J Ophthalmol. 1996 Jun. 121(6):715-7. [Medline]. Markell E. Lumen-Dwelling Protozoa. Markell and Voge's Medical Parasitology. 8th ed. Philadelphia, Pa: WB Saunders, Co; 1999. 24-89. Medical letter on drugs and therapeutics. Drugs for parasitic infections. Med Lett Drugs Ther. 1998 Jan 2. 40(1017):1-12. [Medline]. Micromedex. Albendazole. Available at: http://www.micromedex.com. 2000. [Full Text]. Micromedex. Fumagillin. Available at: http://www.micromedex.com. 2000. [Full Text]. Molina JM, Tourneur M, Sarfati C, et al. Fumagillin treatment of intestinal microsporidiosis. N Engl J Med. 2002 Jun 20. 346(25):1963-9. [Medline]. Patel R. Infections in recipients of kidney transplants. Infect Dis Clin North Am. 2001 Sep. 15(3):901-52, xi. [Medline]. PDR. Physicians' Desk Reference. Montvale, NJ: Medical Economics Company, Inc; 2000. Raynaud L, Delbac F, Broussolle V, et al. Identification of Encephalitozoon intestinalis in travelers with chronic diarrhea by specific PCR amplification. J Clin Microbiol. 1998 Jan. 36(1):37-40. [Medline]. Rosenblatt JE. Antiparasitic agents. Mayo Clin Proc. 1999 Nov. 74(11):1161-75. [Medline]. Sandfort J, Hannemann A, Gelderblom H, et al. Enterocytozoon bieneusi infection in an immunocompetent patient who had acute diarrhea and who was not infected with the human immunodeficiency virus. Clin Infect Dis. 1994 Sep. 19(3):514-6. [Medline]. Schwartz DA, Visvesvara GS, Diesenhouse MC, et al. Pathologic features and immunofluorescent antibody demonstration of ocular microsporidiosis (Encephalitozoon hellem) in seven patients with acquired immunodeficiency syndrome. Am J Ophthalmol. 1993 Mar 15. 115(3):285-92. [Medline]. Strano A, Cali A, Neafie R. Microsporidiosis. Pathology of Tropical and Extraordinary Diseases. Washington, DC: Armed Forces Institute of Pathology; 1976. Vol 1: 336-9. Talal A, Dieterich D. Gastrointestinal and Hepatic Manifestations of HIV Infection. The Medical Management of AIDS. 6th ed. Philadelphia, Pa: WB Saunders, Co; 1999. 195-216. Weber R, Bryan RT. Microsporidial infections in immunodeficient and immunocompetent patients. Clin Infect Dis. 1994 Sep. 19(3):517-21. [Medline]. Weber R, Schwartz D, Bryan R. Microsporidia. Mandell, Douglas, and Bennett's Principles and Practice of Infectious Disease. Philadelphia, Pa: Churchill Livingstone; 2000. 2920-29. Weiss L. Microsporidiosis. Mandell, Bennett, and Dolin's Principles and Practice of Infectious Diseases. 2005. 2: 3237-54. Weller, Peter. Protozoal and Intestinal Infections and Trichomoniasis. Harrison' Principles of Internal Medicine. 17th. 2008. 1314/208. Wittner M, Tanowitz HB, Weiss LM. Parasitic infections in AIDS patients. Cryptosporidiosis, isosporiasis, microsporidiosis, cyclosporiasis. Infect Dis Clin North Am. 1993 Sep. 7(3):569-86. [Medline]. The author would like to thank Deidrea Parker, BS, and the Medical College of Georgia Department of Pharmacy for assistance in the literature review of the drug therapy for microsporidiosis.